Young consumers are increasingly becoming conscious of their drink and food choices. It is this inclination, coupled with the mounting government support for the growth and use of organic products that has been driving the biodegradable paper cup industry as well as the organic hot beverages market segment. Future Markets Insights (FMI) recently conducted a study whose findings indicate that a shift in trends such as increased concern for one’s wellbeing are some of the factors that are influencing the positive growth in the organics drinks segment. When it comes to hot drinks, organic tea and organic coffee happen to be the leading consumer preferences. These are drinks that have attracted a high consumer demand in many European countries. The emerging wave driving responsible consumption among consumers is to thank for the increased demand for biodegradable coffee cups, and compostable tea cups. These are items that are closely associated with the use of hot and cold beverages, both organic and non-organic. Organic tea and coffee are cultivated in farms without the use of synthetic pesticides, insecticides, and fertilizers. Prior to cultivation, the land where they are to be planted is often given ample time to detoxify itself naturally. Once mature, the tea and coffee have to undergo processing before they can be ready for use. No preservatives, colors, chemicals, or artificial flavors are used during this process. Consumers have placed their trust on organic coffee and tea, and believe that the two can offer them benefits that cannot be derived from the traditional variations of the two. Organic beverages do not contain any harmful substances that may find their way into the human body after consumption. As more and more people become conscious of their lifestyle preferences, they will become more inclined to adopt habits that can be construed as being healthy. It, therefore, comes as no surprise that many of them are opting for organic products, despite the fact that they still care about simple issues such as taste. According to a study carried out by HTF Market intelligence, this is something that has seen organic coffee become more popular, and pleasing as opposed to the normal coffee. Based on the studies mentioned above, it is clear that the popularity of organic coffee has soared among Generation Z and the Millennials. But this does not mean that tea has been forgotten or left out altogether. Currently, there is an upsurge of premium, exotic, and organic brands of tea finding their way into restaurants, voguish bars, and in coffee chains. The young generation is known for its propensity to experiment, and try out different new tastes and brews. In order to cater for this ever growing market segment, brands have had to come up with new varieties of premium and organic teas. A good example is the Starbucks chain of coffee shops. The chain recently experimented with organic teas in its India branches, before introducing them to their European market. In addition to its already rich list of coffee varieties, the chain is also offering TeavanaHathikuli tea (a full-leafed organic tea that is sourced from organic farms) in all its stores. Tea houses in the UK have also not been left behind, with many now proposing the inclusion of different organic teas as a part of their fine dining experience. Some of them, however, offer it as an afternoon tea. The coffee industry continues to expand at a rapid pace in the United Kingdom. Today, you will find that there are four times more coffee shops than there was eighteen years ago. Additionally, one out of every five people in the country visit a coffee shop on a daily basis. It is expected that by the year 2025, there will be close to thirty thousand coffee shops in the country, with an estimated annual turnover of close to fifteen billion pounds. Today, unlike in the past, you do not have to visit a coffee shop to get your cup of organic coffee. The beverage has increasingly become available, with supermarkets, garages, and shopping malls being some of the locations where one can easily go to for a cup of their favorite beverage. This increase in its popularity has led to the introduction of disposable cups in a bid to meet consumer needs. Apart from the numerous economic benefits that come with consumption of caffeinated drinks, businesses have also made a commitment to protect the environment by eliminating single use cups, and replacing them with biodegradable coffee cups. Modern coffee consumers are more than willing to pay extra for their coffee, provided that the paper cups being used meet their ethical and environmental standards, and are friendly to their environment. Many companies and coffee shops all over Europe have today taken to using 100% biodegradable coffee cups. They are not only using this to remain in good standing with their clients, but also as a way of protecting the environment. Because of this, the paper industry has continued to maintain a positive growth rate, alongside the ever-increasing demand for organic coffee and tea, and the need for businesses to adopt sustainable solutions. Studies have over time indicated that companies that prove they are environmentally-friendly tend to have an advantage over their competitors who do not. At Scyphus, we can help you gain a competitive advantage over your competition with our 100% compostable and biodegradable paper cups. All our cups are lined with PLA (polylactic acid) that is derived from cornstarch. Currently, we have hundreds of satisfied clients using our 100% biodegradable coffee cups to provide their clientele with the satisfaction they desire, while at the same time embroidering their brand image. 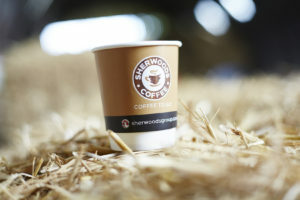 Our paper cups are easily composted alongside food waste. Studies conducted within the scientific community have shown that biodegradable coffee cups can be broken down within twelve weeks. In addition, these cups are harmless for atopic consumers since they do not contain allergens.